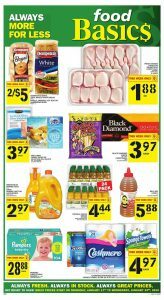 Food Basics Flyer Special Sales 19 Jan 2019 contains special food deals and perfect personal care items for amazing prices. Let’s click on the image and get more information about discounted products. Always more for less on everything in this flyer. Check out all rayons and find the cheapest prices. If you are going to work, you can visit a Food Basics store and buy something for breakfast. Do not miss out front street bakery’ produces. Food Basics Flyer Special Sales 19 Jan 2019 will make you cheer! Special deals, daily beasts and online sales on right now. It would be great if you visit the store. Or you can visit the official website of Food Basics too. They are all daily and almost for free. Enjoy your food for good prices of Food Basics. Daily deals and daily beasts are waiting for you in this flyer.